The success of public realm projects is entirely dependent on the quality of the workmanship. JCL have the direct personnel and specialist subcontractors with experience with natural stone installation and with the vision and ability to interpret and deliver on an architects design. The very nature of public realm projects results in a huge focus on stakeholders. The public will be affected by the works in the short term. Building and maintaining relationships with businesses, residents, road users is a key focus of our public realm projects. Public realm projects inevitably contain products with long lead times such as granite and limestone. Managing the supply of these products and aligning the supply with the progress on site is a major challenge and one that JCL excel at. The 10,000m2 central plaza in one of Irelands largest towns, laid out initially in the 1740’s was completely redeveloped in 2012. 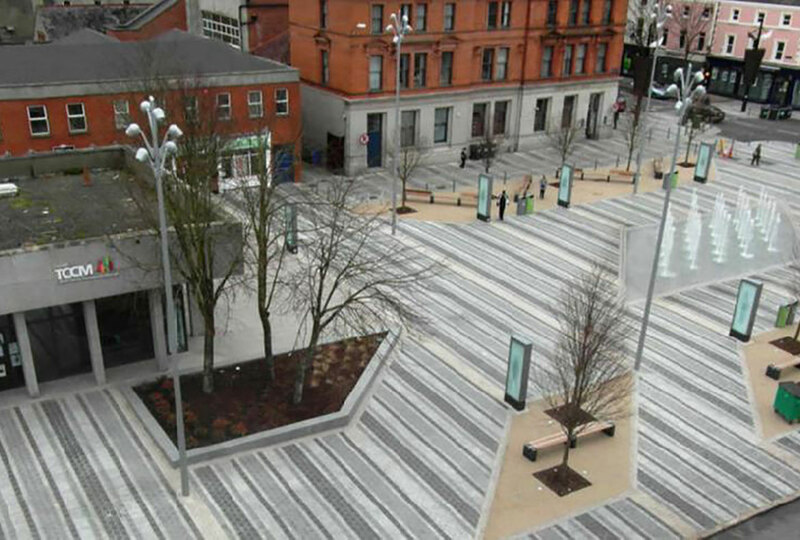 Designed by Nicholas de Jong Architects and awarded by Dundalk Town Council, the largest that they had ever undertaken, John Cradock Ltd delivered an unparalleled public space for the people of Dundalk.